This class implements an HTTP client. It can be used to interact with web services using the HTTP protocol. The client uses asynchronous I/O and only provides an asynchronous interface: you cannot actively wait for an operation to complete, instead the client will notify you of the result using the done() signal. Because the client uses asynchronous I/O, it does its work within the scope of an event-driven thread pool implementation. By default, this is the same thread pool that is used by the Wt server, available through WServer::ioService(), but you may also use the client by providing it an explicit I/O service to be used. The client supports the HTTP and HTTPS (if Wt was built with OpenSSL support) protocols, and can be used for GET and POST methods. One client can do only one operation at a time. The function connected to the done() signal will be run within the context of the application that created the client. WServer::post() is used for this. When you want to add authentication information in the URL, this can be done as https://username:password@www.example.com/. When doing this, make sure that the username and password string are URL-encoded (Wt::Utils::urlEncode). For example, https://username:pass word@.nosp@m.www..nosp@m.examp.nosp@m.le.c.nosp@m.om/ should be passed as https://username:pass%20word@www.example.com/. The client uses the I/O service and thread-pool from the current WApplication::instance(). 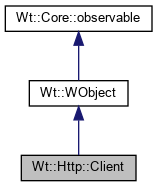 The client uses the given I/O service and thread-pool, and is useful to use the client outside the context of a web application. If the client is still busy, the current request is aborted. If the client is currently busy, this cancels the pending request. done() will be emitted with asio::error::operation_aborted. The abort will be performed asynchronously, so it is possible that done() is still emitted with a successful response after abort() is called. Signal that is emitted when more body data was received. The signal contains the next body data chunk received. You may want to catch this signal if you want to process the response as it is being received. You may want to use this in combination with setMaximumResponseSize(0) to handle very long responses. The function starts an asynchronous DELETE request, and returns immediately. The function returns true when the DELETE request has been scheduled, and thus done() will be emitted eventually. The function returns false if the client could not schedule the request, for example if the url is invalid or if the URL scheme is not supported. Signal that is emitted when the current request is done. The error is 0 if the HTTP request was successful. Then, the message contains the result. If the error is not 0, then an error message is given by err.message(). Returns whether the client will follow redirects. The function starts an asynchronous GET request, and returns immediately. The function returns true when the GET request has been scheduled, and thus done() will be emitted eventually. This function accepts one or more headers. Signal that is emitted when all response headers have been received. The signal forwards the message with all headers, but with empty body text. You may want to catch this signal if you want to examine the headers prior to having received the complete message. Returns whether SSL certificate verification is enabled. Returns the maximum response size. Returns the maximum number of redirects to follow. Utility method to parse a URL. This parses a URL into an URL object. The method returns true if the URL could be parsed successfully. The function starts an asynchronous PATCH request, and returns immediately. The function returns true when the PATCH request has been scheduled, and thus done() will be emitted eventually. The function starts an asynchronous POST request, and returns immediately. The function returns true when the POST request has been scheduled, and thus done() will be emitted eventually. The function starts an asynchronous PUT request, and returns immediately. The function returns true when the PUT request has been scheduled, and thus done() will be emitted eventually. The function starts an asynchronous HTTP request, and returns immediately. The function returns true when the request has been scheduled, and thus done() will be emitted eventually. Set whether the client will follow redirects. If set and the request method is GET, redirects are automatically followed. Sets a maximum response size. The response is stored in-memory. To avoid a DoS by a malicious downstream HTTP server, the response size is bounded by an upper limit. The limit includes status line, headers and response body. The default value is 64 kilo bytes. A value of 0 has a special meaning: the size of the response will not be limited, but the response body will not be stored in the response message. Instead the data is made available only to bodyDataReceived() to be processed incrementally. Set the maximum number of redirects to follow. This is used only when followRedirect() is enabled. For https requests, it is (very strongly!) recommended to perform certificate verification: this verifies that you are indeed connected to the server you intended (and not to a man-in-the-middle). Without such a check, encryption simply isn't very useful. Nevertheless, there may be situations in which you will want to disable this functionality. The default configuration is to have certificate verification enabled. Sets a SSL certificate used for server identity verification. This setting only affects a https request: it configures a certificate file to be used to verify the identity of the server. Certificate verification does not work reliably yet. Sets a path with SSL certificates for server identity verification. This setting only affects a https request: it configures a directory containing certificates to be used to verify the identity of the server. This sets a timeout waiting for I/O operations. The timeout does not bound the total timeout, since the timer is reset on each I/O progress. The default timeout is 10 seconds.